While Egypt and MENA have barely jumped into the Instagram shopping game, the USA is getting a brand-new shopping feature that will make it much easier for users to shop within the platform. The photo-sharing platform released yesterday that they have launched “Checkout on Instagram,” currently only available in the USA. The new Instagram shopping feature is part of Facebook’s overall strategy to monetize its higher growth platforms and products, which Instagram ranks high on with over 1 billion users (Jun 2018). The new feature will allow users to buy directly from the app, by putting in their credit details as well as receiving notifications within Instagram. Users will then be brought to a product page, similar to any normal ecommerce page, where they will choose color/sizes. They can then purchase the item after adding their billing and credit card information; Reuters states that users can currently use Visa, Mastercard, American Express, Discover or PayPal to checkout. 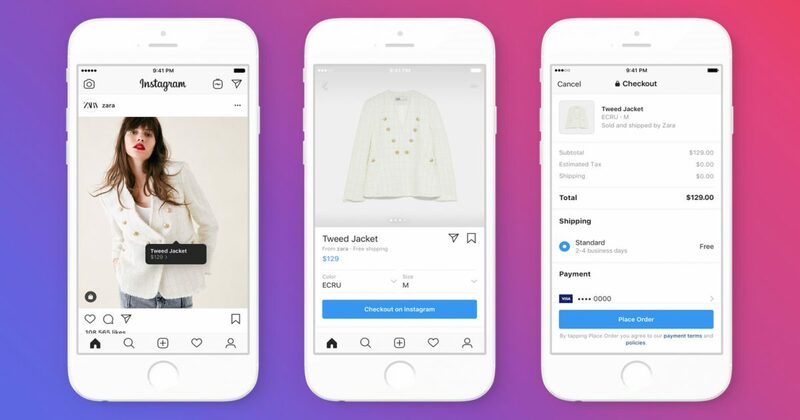 According to an Instagram spokesperson, users can currently only buy one item at a time, but the Instagram team are exploring ways to improve the experience, which would include a multi-item shopping cart. Supposedly, posts with product tags will not be given priority or more visibility on the app, appearing normally and as often as a normal post. Users will also receive notifications about shipment and delivery within the application. On its side, Instagram looks to be monetizing through a “selling fee” to cover expenses such as its purchase protection policies, which will allow Instagram to provide a full refund including shipping if the merchant won’t refund themselves. Checkout on Instagram is currently in Beta, and has only partnered with 20+ major brands such as Adidas, Nike, Burberry, Huda Beauty, Michael Kors, H&M and Zara. There is also no word if it is currently or will be available on Stories. If not, then it will be quite a loss as a recent report we got at Dubai Lynx states that the adoption of stories has grown from 400M in June 2018 to 500M in Jan 2019. The report also stated that 1 in 3 stories get a direct message (April 2018). Something marketers should consider before jumping excitedly is Facebook continues to be under pressure for various breaches of security and privacy on their platform. This could mean that internationally, there may be some backlash or a lot of resistance against the new online shopping feature. Whether this is something that marketers in MENA should worry about is difficult to say, as many consumers in the region aren’t that aware of the controversies. This is part of Facebook moving forward with its plans to monetize Instagram and Messenger as Facebook’s newsfeed product struggles to grab fresh interest and attention.